Macau’s casino stocks are priced for perfection. A building boom will expand capacity in China’s gambling enclave. But to justify their valuations, gaming operators not only need to attract more punters but encourage them to spend more at the tables. Any slowdown or increased competition could test excited multiples. The former Portuguese colony is running out of room. Hotels are effectively full, even though over half of the 29 million tourists who visited Macau in 2013 were day-trippers. That is why casinos are rapidly adding capacity. The total number of four- and five-star hotel rooms in Macau will grow 40 percent by 2018, according to Las Vegas Sands. Last year, Macau’s six licenced casino operators raked in some HK$321 billion ($41.4 billion) in combined revenue. If visitor revenues expand in line with hotel capacity, then revenue would reach about HK$450 billion by 2018. Apply the industry’s margin of around 21 percent, and the casinos’ combined EBITDA would reach roughly HK$95 billion. But investors expect Macau to do even better. According to Eikon forecasts, combined revenue is expected to hit HK$506 billion as early as 2016. Moreover, the combined EBITDA margin is forecast to rise to 24 percent. That implies casinos will not only attract more visitors, but also squeeze more revenue and profit out of them. They could do that by luring more punters who come to Macau under their own steam rather than through tours organised by subsidised junket operators. So-called mass market visitors accounted for a third of Macau’s gross gaming revenue last year, Las Vegas Sands estimates, but generated two-thirds of operating profit. However, much could go wrong. Any slowdown in visitor growth could leave casinos with excess capacity, forcing them to compete more intensely for business. 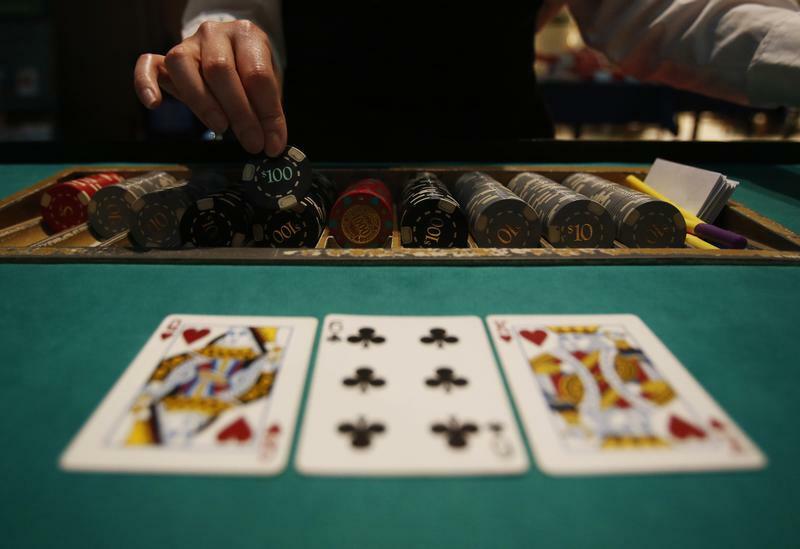 New casinos in places like Japan could lure away Macau regulars. Construction or labour delays to new hotels could upset revenue forecasts. Macau’s gaming operators could yet fulfil their lofty forecasts, but their shares leave little room for disappointment. All six listed casinos are currently valued at more than nine times their expected 2016 EBITDA. It will take a lot for those earnings to come up trumps. A dealer picks up chips on a mock black jack casino table during a photo opportunity at an international tourism promotion symposium in Tokyo September 28, 2013. Macau-based casino operator SJM holdings reported 2013 gaming revenue of HK$86.96 billion ($11.2 billion) on Feb. 26. That is a 10.2 percent increase on 2012’s full year figure. Net profit after tax for the year was HK$7.7 billion, up 14.4 percent from the same period in 2012. The company said the occupancy rate for its larger Grand Lisboa hotel was up 96.4 percent for the full year 2013, with an average room price of HK$ 2,235. Roughly nine out of ten Macau guests stayed at four and five star hotel rooms in the first 11 months of 2013, according to government statistical data.